I’m on my way to Puerto Rico—to warn people that God uses extreme vetting. What do I mean by that? I want the people of Puerto Rico to know that God loves them and that there is only one way to enter the gates of heaven—and that is through faith in Jesus Christ, and Him alone. Good works can’t get you into heaven. Religion can’t either—being a Baptist, a Catholic, or a Methodist, can’t save you. Jesus said, “I am the way, the truth, and the life. No one comes to the Father except through Me.” Thousands of Christians have been praying across the island for this weekend. I’ll be preaching the Good News that God loves sinners and sent His Son, Jesus Christ to die for their sins. My purpose for going is to help Puerto Ricans “immigrate” from earth to heaven one day. I want Puerto Ricans by the thousands—and people everywhere—to have their immigration status in Heaven stamped and sealed with the blood of Jesus Christ for all eternity. While I’m tempted to run in a lot of different directions with this, there was a second, even more infuriating reason for me to write here: a beloved community member in our neighborhood was pulled over by ICE (Immigration and Customs Enforcement) officers over the weekend, who were allegedly impersonating Baltimore City police officers. They arrested him and sent him to a detainment facility in Frederick. You can read more here and see that this is a trend nationwide in increased enforcement. This follows multiple affirmations by city police and officials that people will not be stopped or questioned out of suspicion of their immigration status. In a neighborhood where trust of police is already low and crimes committed against immigrants are largely unreported, this is a huge blow (not to mention the loss we are feeling a community member who did so much to heal racial/ethnic divides amongst youth). To be clear, this young man was not a violent criminal. He was a valued community member. As a result, neighbors organized in about 12 hours to rally together in our neighborhood to march in solidarity for our immigrant neighbors. Kara and I eagerly joined the hundreds of people from a variety of backgrounds, beliefs, and statuses to say collectively that immigrants are welcome here, that they matter, and that we are with them. We want our neighbors to be able to work and go to school and to the store without increased fear, and we want them to see their neighbors love them. 16 From now on, therefore, we regard no one from a human point of view; even though we once knew Christ from a human point of view, we know him no longer in that way. 17 So if anyone is in Christ, there is a new creation: everything old has passed away; see, everything has become new! 18 All this is from God, who reconciled us to himself through Christ, and has given us the ministry of reconciliation; 19 that is, in Christ God was reconciling the world to himself, not counting their trespasses against them, and entrusting the message of reconciliation to us. 20 So we are ambassadors for Christ, since God is making his appeal through us; we entreat you on behalf of Christ, be reconciled to God. 21 For our sake he made him to be sin who knew no sin, so that in him we might become the righteousness of God. Our responsibility as ambassadors of the kingdom of God is not to talk about a stringent vetting process (and baptize it with spiritual language), it is to urge others to receive the free gift of reconciliation from God. Restored relationship with God is available to all because of the work of Jesus. The results of a background check do not deny us entry into the kingdom of God! They pre-qualify us for the demonstrated need for reconciliation in the first place! The good news does not compel us to build walls, but rather proclaims that the walls which have divided us are destroyed in Jesus.We see this in Paul’s discussion of the Dividing Wall of Hostility in Ephesians 2. We catch a vision in Revelation of embodied difference in the Kingdom, yet unity in Spirit as we will gather around God’s throne from every nation, tribe, and tongue to worship. In a new heavens and a new earth where the gates will never be shut, by the way! What is lost in this analogy of vetting and gates and such is that Scripture refers to followers of Jesus as immigrants, as people in exile. We have our citizenship in heaven (Phil 3:20) and are described as exiles and foreigners (1 Peter 2:11) Not only are we to practice love and hospitality for others (and hospitality literally means a “love of the foreigner”), we are ourselves foreigners, strangers, and exiles. God’s Kingdom is our home. 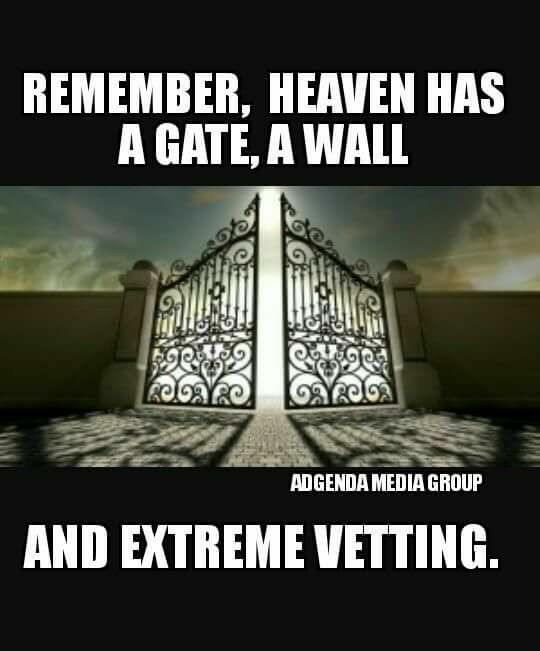 When we talk about heaven (or, more biblically, the new heavens and new earth) as a place with extreme vetting, walls, and gates and when we cheer the building of walls and the deportation of “those people” and it gets likes and shares on social media by other Christians, we must admit that there is a reason why this is good news for many of those who support such measures. Extreme vetting is good news for those who fear the other. Walls are good news for those who want to be safe. Gates are good news for those who want a strong selection process for their eternal neighbors. This is good news for white, privileged Christians because it starts to make heaven look a lot like the American idyllic life. This is how someone like Graham can make the statements he makes: he truly believes them. But how is this good news for the refugee family? How is this good news for Lazarus at the rich man’s gate? How is it good news for the majority of the world’s population? How is it good news for our immigrant neighbors who are wondering if they can even take their kids to school anymore? Quite simply, I don’t think it is. The good news for all of us, is that God loves us all so much that God has made a path of return, reconciling everything and all of us. The vetting process is overturned, because the wages of sin is death. Vetting is BAD NEWS not good news!! It is all about gift. And the gate has been flung open wide and the invitation extended to all regardless of country of origin, background, orientation, identity, or ideology. Should anyone desire to enter, they are welcome to do so. This is good news for all of us. And this is why we march in solidarity. This is why we sing “You’ll Have to Go Through Me” (a wonderful song written by one of our community members). Our neighbors see what sort of good news we believe and embody. Kara commented on how many of our Latino neighbors stepped out of their workplaces along the street as we marched by, smiling and waving. They knew we were there to support them and their families. They knew they were loved and valued. I want to make every effort to show that the good news I believe and proclaim is, in fact, good news for all my neighbors–not just the ones who share my privilege, who look like me, or who agree with me. Yesterday, proclaiming the good news meant chanting: “No Hate. No Fear. Immigrants are welcome here.” and “Aqui estamos y no nos vamos” (We are here and we aren’t leaving).